Ferries del Caribe will transport stranded PAWA passengers on its Kydon cruise ship. The “Kydon,” obtained from Greece, has a draft of 21.9 feet, its size is 629.7 feet long, with a width of 78.8 feet and can sail at a maximum speed of 25 knots. Ferries del Caribe executives confirmed Wednesday it will resume maritime transportation services of passengers, cars and cargo between Puerto Rico and the Dominican Republic on May 3. The service between the port of San Juan and the Don Diego Port in Santo Domingo will be offered on “the most modern, largest and fastest cruise ferry boat” the company has used since it began operating in 1998, company executives said. Ferries del Caribe has invited Puerto Rico and Dominican Republic government officials and members of the media to a news conference next week prior to the inaugural trip. The cruise ferry’s regular route will depart on Mondays, Wednesdays and Fridays from San Juan to Santo Domingo at 7 p.m. and Tuesday, Thursday and Saturday from Santo Domingo to San Juan, also at 7 p.m. The service is being re-launched more than a year after a fire consumed the vessel used to provide transportation between the neighboring islands. Now, the company will use a new ship that was completely renovated in 2015 and is of Japanese construction. The “Kydon,” obtained from Greece, has a draft of 21.9 feet, its size is 629.7 feet long, with a width of 78.8 feet and can sail at a maximum speed of 25 knots. The eight-story luxury ship has a capacity for 1,750 passengers and 111 crew members. It has 175 cabins and 163 pre-numbered seats a designated area for luggage. Floors two, three and four are designed for cargo and passenger vehicles with a capacity to transport 70 cars per trip and 1,669 linear meters to carry cargo containers. On the ship’s sixth floor are the reception area, a spa, a beauty salon, duty free shop, a disco bar and corridors with seating and tables overlooking the ocean. On the seventh floor is an open deck, a covered outdoor space with an ocean view and bar that features live music. A main lounge is also located on the seventh floor. Two restaurants run by a new gastronomic team are located on the ship’s eighth floor, where passengers who travel on pre-numbered seats will be located for easy access to the dining rooms, said Ferries del Caribe President Néstor González. “In tough economic times like Puerto Rico is facing, we are committed to a rebirth, which is why today we have reason to celebrate. 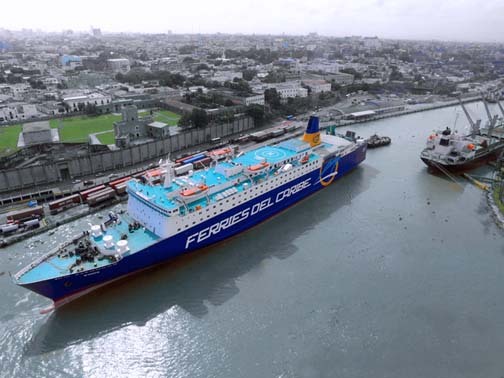 The rebirth of Ferries del Caribe creates 200 direct jobs and 300 indirect jobs,” González said. Hey Buddy!, I found this information for you: "Ferries del Caribe to resume PR/DR service on May 3". Here is the website link: https://newsismybusiness.com/ferries-resume-service/. Thank you.